Are you still confused as to what would be the best fabric to use in creating your wedding dress? 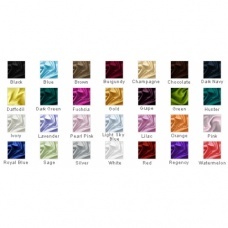 Or are you having trouble deciding what would be the best color tone that can go along with the fabric of your choice? If you need to get the right kind of fabric to have your dress tailored made to the right specifications, then you should check out the different color swatches we are offering here. These are samples of fabrics that you can avail before you proceed in creating your actual wedding dress. The swatches being displayed are categorized into different textiles and each of the fabrics comes in different colors so that you will be able to decide the ideal fabric for the wedding dress of your dreams. Each of the textiles comes in 10 x 10 inches color swatches and it will be shipped or deliver right into your doorstep upon placing the order (as per customer's choice). The price differs depending on the clothing material and all of the products being offered here are guaranteed high quality. If you are not sure about the fabric, it is best to check out the swatch in person before placing an order of your wedding dress.